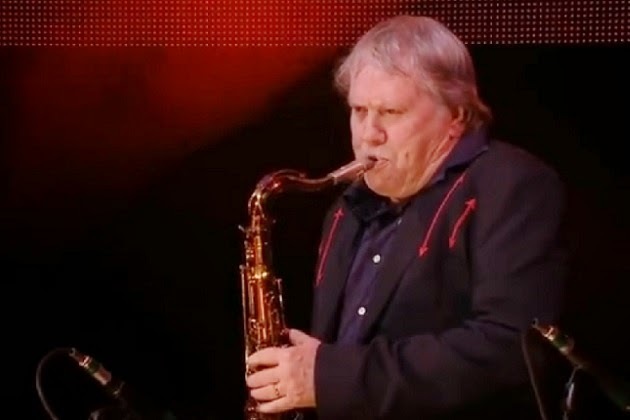 NASHVILLE, Tenn. (AP) — Bobby Keys, a saxophonist and lifelong rock 'n' roller who played on recordings by Buddy Holly and John Lennon and performed one of the all-time blowout solos on the Rolling Stones' "Brown Sugar," has died at his home in Franklin, Tennessee. He was 70 years old. Michael Webb, who played keyboard with Keys, said Keys died Tuesday after a lengthy illness. Keys had been on tour with the Stones earlier this year before his health prevented him from performing. Known for his heavy jowls and raw, raucous style, the Lubbock, Texas, native was born on the same day as Keith Richards — Dec. 18, 1943 — and the Stones guitarist would often cite Keys as a soul mate and favorite musician. Besides "Brown Sugar," Keys also played memorable solos on such Stones favorites as the 7-minute jam "Can't You Hear Me Knocking" and the country-styled "Sweet Virginia." Other career highlights included John Lennon's chart-topping "Whatever Gets You Through the Night" and albums by Richards, George Harrison, Barbra Streisand and Eric Clapton. "I have lost the largest pal in the world, and I can't express the sense of sadness I feel, although Bobby would tell me to cheer up," Richards said in a statement. Keys' career dated back to the 1950s, when as a teenager he played with fellow Lubbock native Holly and The Crickets. He met the Stones in the mid-'60s while they were on the same bill at a state fair in San Antonio, Texas, and was distraught that the British rockers had recorded a cover of Holly's "Not Fade Away." "I said, 'Hey, that was Buddy's song,'" Keys recalled in Richards' memoir "Life," published in 2010. "Who are these pasty-faced, funny-talking, skinny-legged guys to come over here and cash in on Buddy's song?" But once Keys listened more closely, he decided the Stones were playing "actual rock and roll," an opinion the Stones more than shared about Keys. He first recorded with them in the late 1960s and toured and recorded with them off and on over the following decades, his work featured on three of the group's most acclaimed albums: "Let It Bleed," ''Sticky Fingers" and "Exile on Main Street." In some ways, he was too close to Richards, developing a heroin addiction that led to his temporary estrangement from the group. But he was with them on every major tour over the past quarter century, dependably stepping up for his solo on "Brown Sugar." Keys' memoir "Every Night's a Saturday Night" was published in 2012, with a foreword by Richards. Keys recalled that he was first exposed to rock 'n' roll through Holly's music — not on the radio, but at the grand opening of a Texas gas station near the home of Keys' grandparents. It was the first time he had heard an electric guitar played live. "And right then and there I knew I wanted to have something to do with that music," Keys explained. Holly "just kinda lit a fuse that started burning then, and it's still burning now."